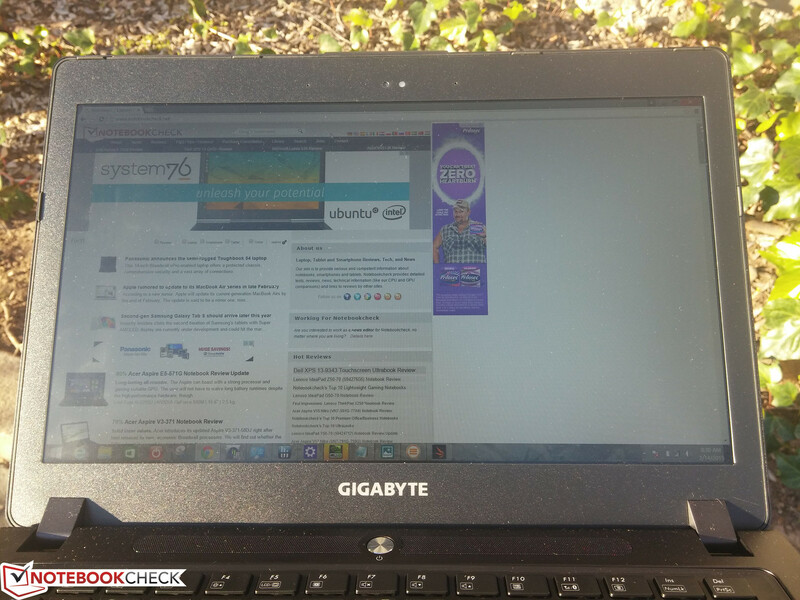 GTX 970M in a 14-inch laptop. 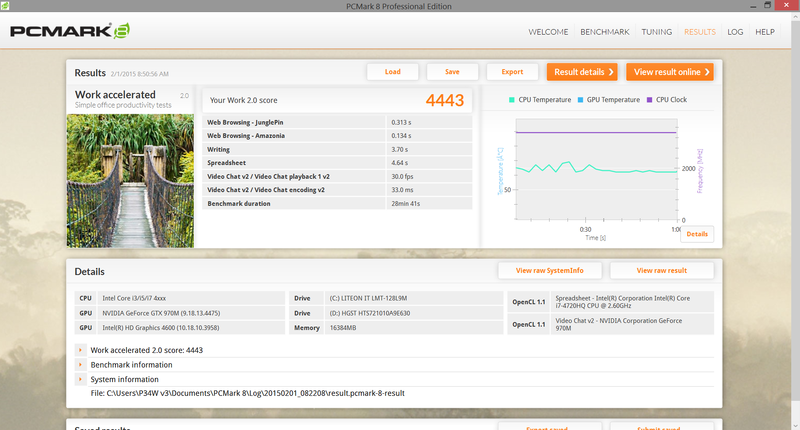 What happens when you cram a 2.6 GHz i7-4720HQ CPU and an Nvidia GTX 970M together in an ultrathin 14-inch form factor? 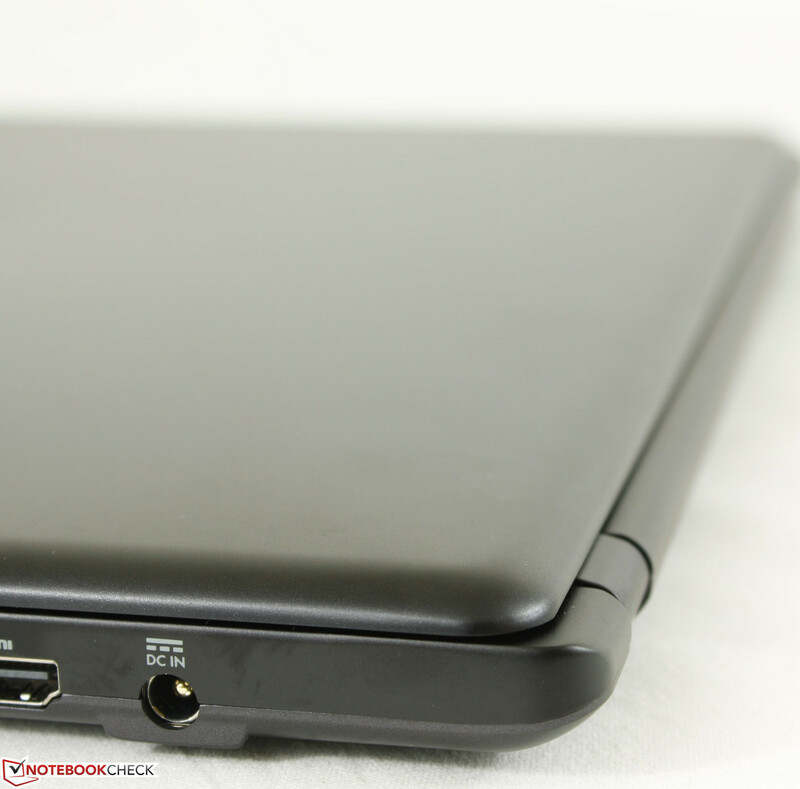 You get one of the fastest and truly portable gaming notebooks around - albeit one with some thermal issues. 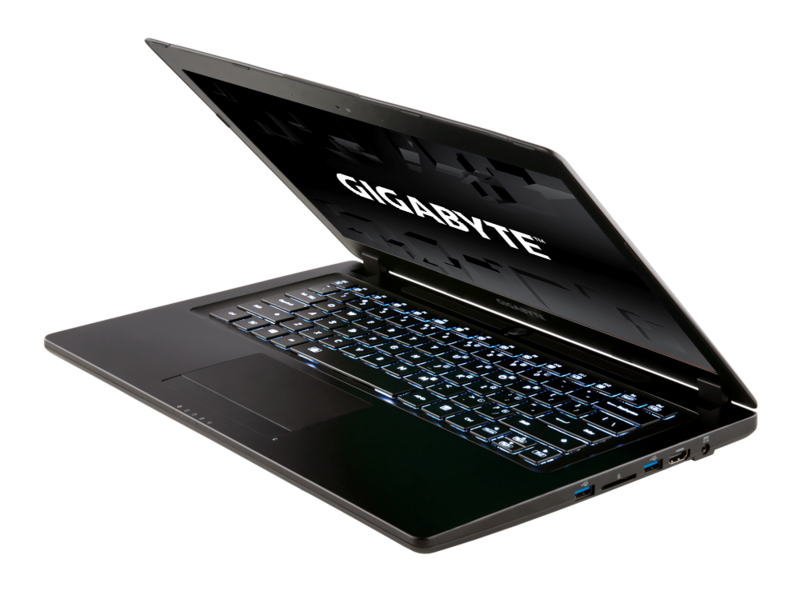 Though more well-known for their desktop components and related hardware, Gigabyte also produce relatively powerful laptops with impressive hardware aimed at gamers. Our 14-inch P34W v3 is the third iteration of the manufacturer's smallest model, yet the diminutive size is by no means an indication of power as the larger 15.6-inch P35 and 17.3-inch P27G models carry similar GTX 9xxM or GTX 8xxM options. Equipped with high-end components like the 2.6 GHz Core i7-4720HQ and GTX 970M GPU, the P34W v3 is one of the fastest 14-inch notebooks currently available in the market. Gigabyte advertises the new P34W as the "perfect partner for those who make no sacrifice in mobility and performance". 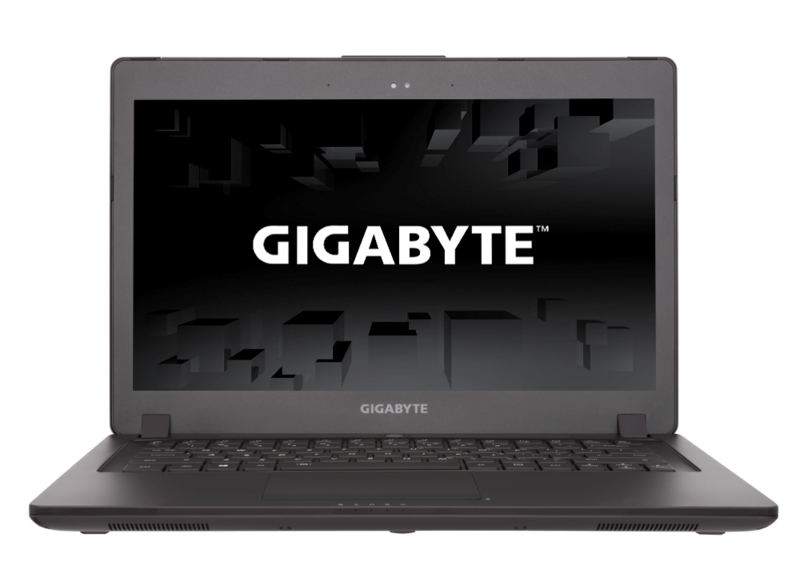 It's almost ludicrous how Gigabyte have managed to squeeze in enthusiast-level components that are normally reserved for thick 15.6-inch chassis or larger in an ultralight form factor. We dig deeper in this review to see just how this was accomplished and if performance or stability had been compromised in the process. One would expect high-end gaming notebooks to be flashy or showy, but Gigabyte models are typically more subdued and restrained in terms of design. We're fans of this approach as not all users agree with the boisterous designs of dedicated gaming hardware like the Alienware models. 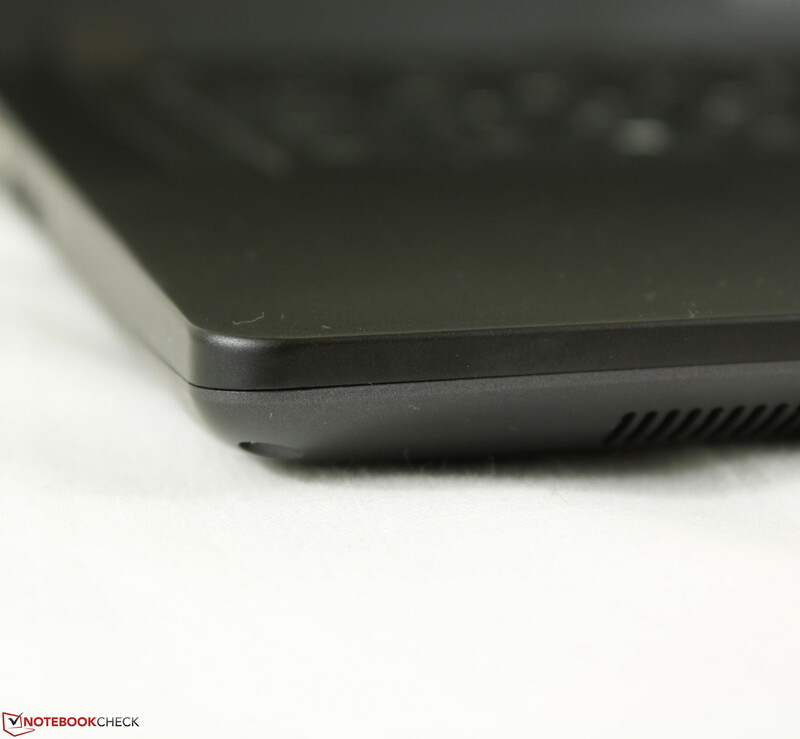 The sleek dark gray and smooth matte surfaces are reminiscent to the Asus ROG models, yet the rounded off edges and corners contrast the sharper and more defined design of a typical ROG notebook. In general, this carries a high-end-but-low-key kind of feel. Otherwise, the chassis is quite barebones with no special texture or accents; It would be easy to mistake the P34W as a regular mainstream notebook at first glance. 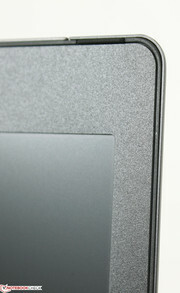 In terms of quality, however, the case is a step above mainstream with surfaces that feel solid and well put together. It's not a unibody design, but there are no major creaking, cracks, or crevices to speak of between the plastic and aluminum materials. Pushing down on the palm rests results in no depressions and only slight depressions when applying pressure on the center of the outer lid. The two hinges, though small in size, hold the light display rigidly with no rocking up to its maximum 135 degree angle. 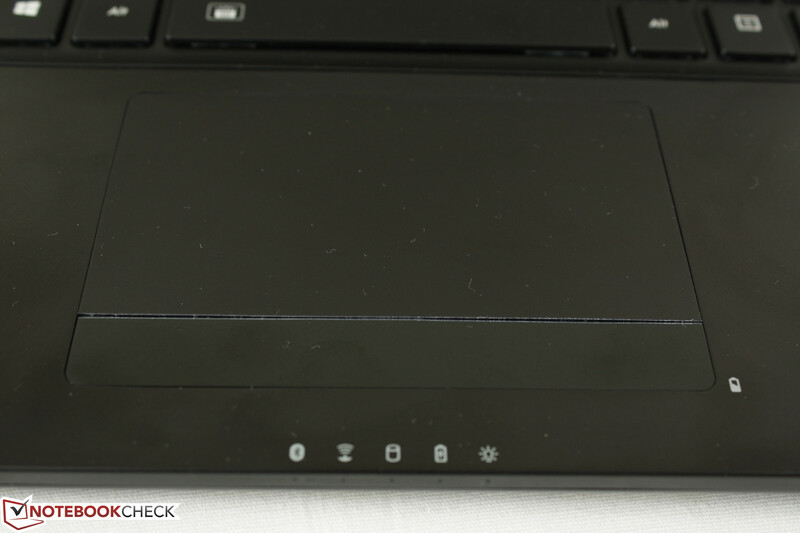 The center of the keyboard is perhaps the only area that feels a bit weaker than the rest of the notebook. 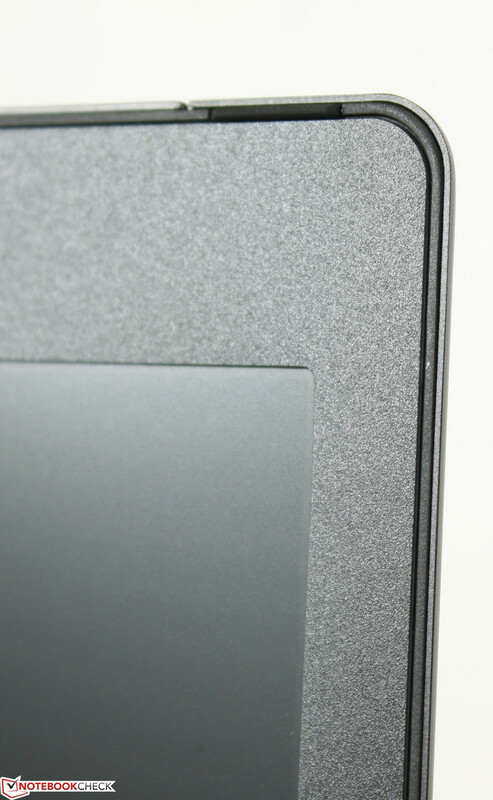 Beyond the typical fingerprint magnet aspect common amongst smooth matte surfaces, there is actually little to complain about the overall quality of the chassis. 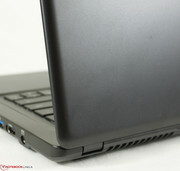 The minimalistic design choice ultimately comes down to reducing the weight and size of the notebook as much as possible. At only 20.9 mm thick, the P34W is almost as thin as today's 14-inch Ultrabooks and thinner than the much weaker Lenovo Y40. 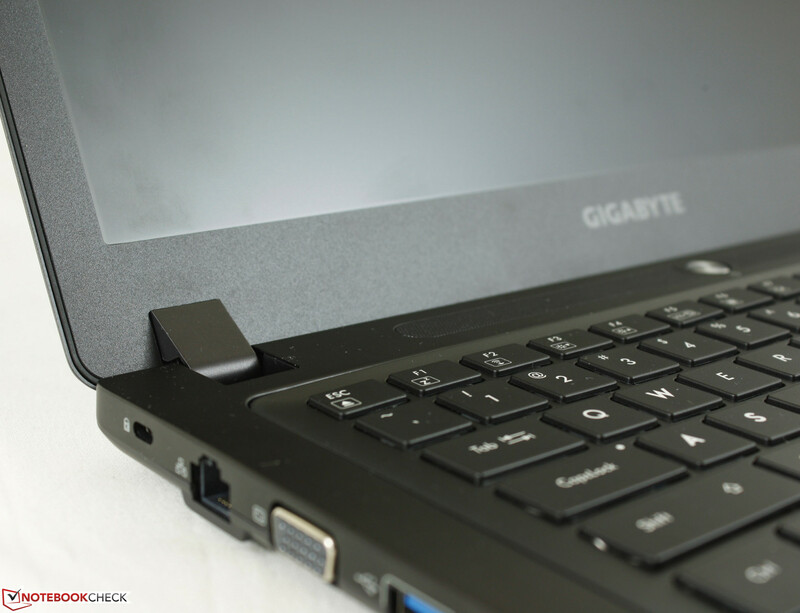 It doesn't quite reach the thinness of a 14-inch Razer Blade, however, as the Gigabyte is still about 4 mm thicker, but it still manages to come in lighter than the Blade by about 100 grams (1.9 kg vs. 1.8 kg) and can be even lighter by another 100 grams if the internal secondary HDD is removed. 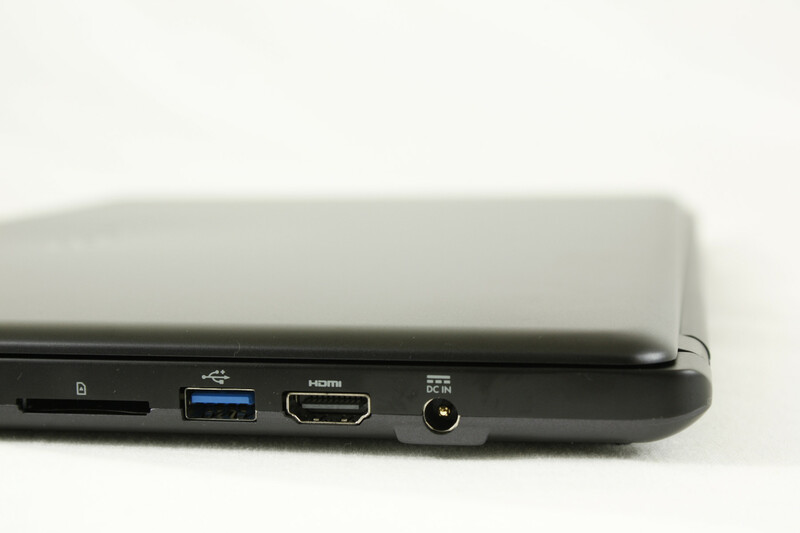 Available ports include the usual HDMI-out and SD reader, but we're surprised that the P34 includes a very healthy number of USB 3.0 ports for the size and even a VGA-out port. There is unfortunately no DisplayPort of any kind or additional audio ports (SPDIF, line-in) that are common on larger gaming notebooks like the 15.6-inch Chimera CX-9 or even larger 17.3-inch Asus G751. WLAN is provided by a half-mini PCIe Intel 7260 dual-band (2x2) card with support up to 867 Mbps through an 802.11ac network and integrated Bluetooth 4.0. We experienced no drops or issues connecting to a standard wireless network. 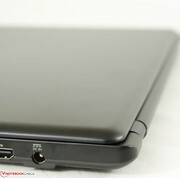 No WWAN or GPS options exist as expected from a gaming notebook. 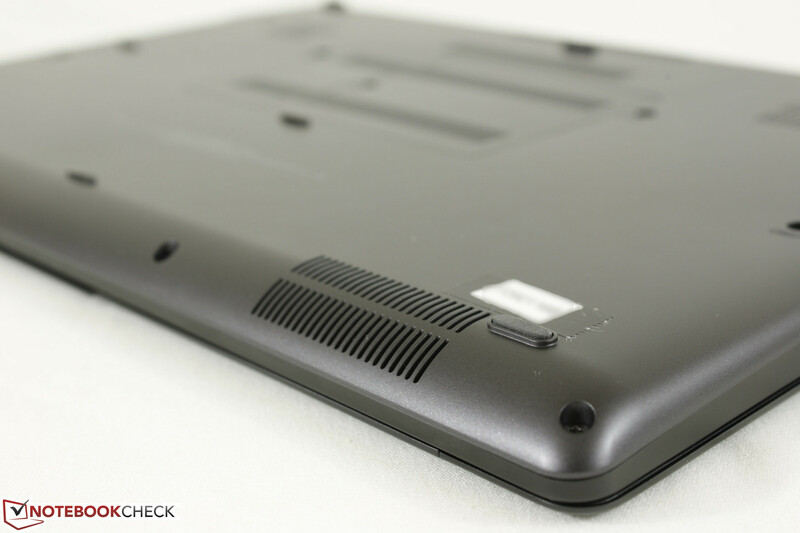 The P45W includes no accessories outside of its AC charger. 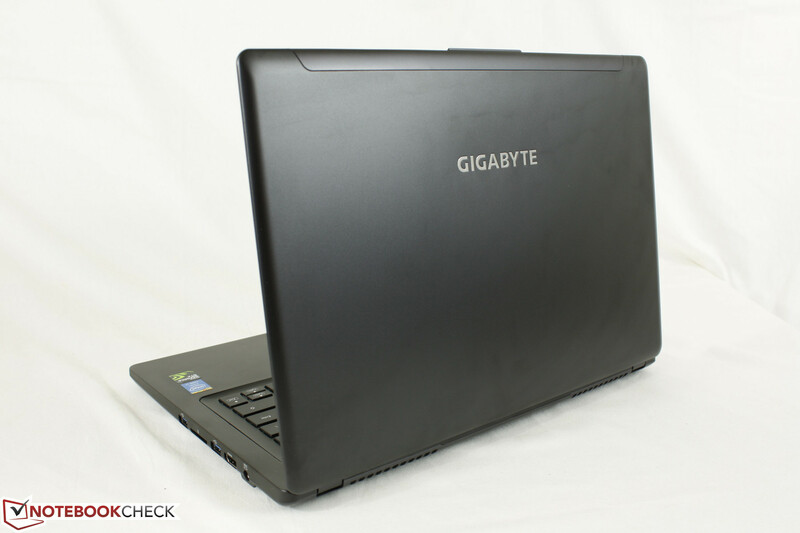 Gigabyte markets generic keyboards, mice, speakers, and other branded items directly through its online market. 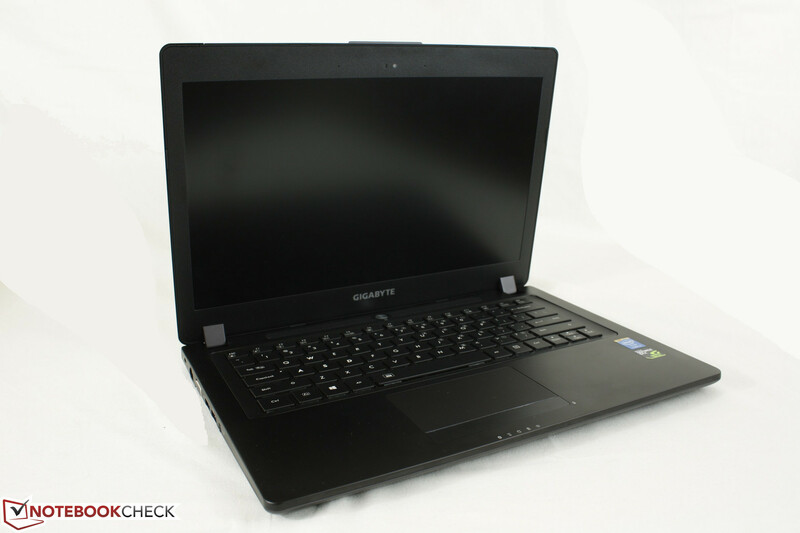 Gigabyte provides a global two-year and one-year warranty for all of their notebooks and netbooks, respectively. Additional options should be available through the various resellers. The keyboard (28.5 x 10.5 cm) provides all the basic keys and nothing else; We would have liked to have additional multimedia or auxiliary macro keys to aid in gaming. The directional keys are also not full-size, which will take some time to get used to for games that take advantage of these keys. Otherwise, the keys provide short travel as is normal on thin-and-light notebooks, so Ultrabook users should feel right at home. 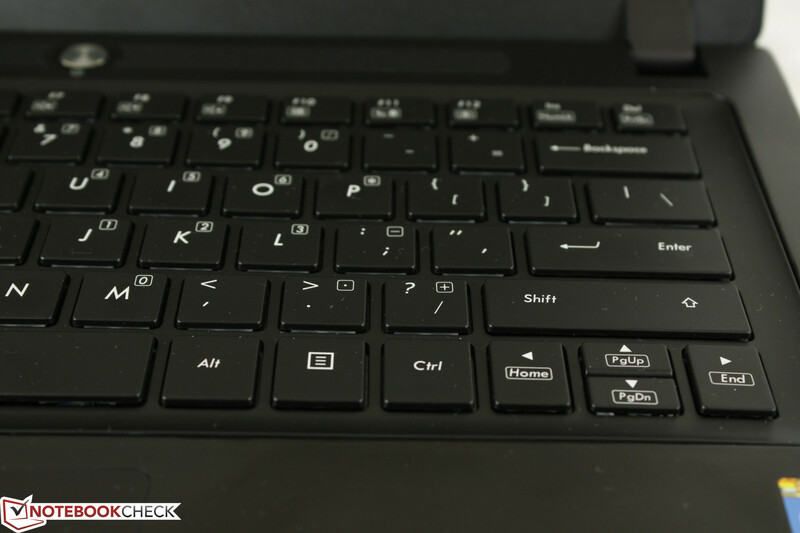 In terms of feedback, however, the keys do provide a slightly more satisfying and firm click than on most Ultrabooks where the keys can sometimes feel mushy, such as on older Samsung Series 9 models. Meanwhile, the bright backlight provides two levels of brightness and is actually white in color despite Gigabyte marketing it with a bluer tone. The ambient light sensor can automatically adjust the keyboard backlight as well as the usual display backlight. 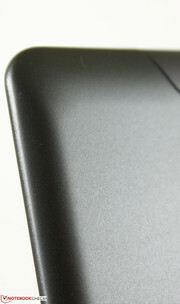 Gaming touchpads are normally quite small as almost all gamers will want to use an external mouse. The slightly rubberized touchpad here (10 x 5.5 cm) will get the job done without any inaccuracies or jumping onscreen pointers for those situations where an external mouse may not be practical. The ELAN software supports multi-touch gestures up to three fingers and responds quite accurately despite the small surface area. 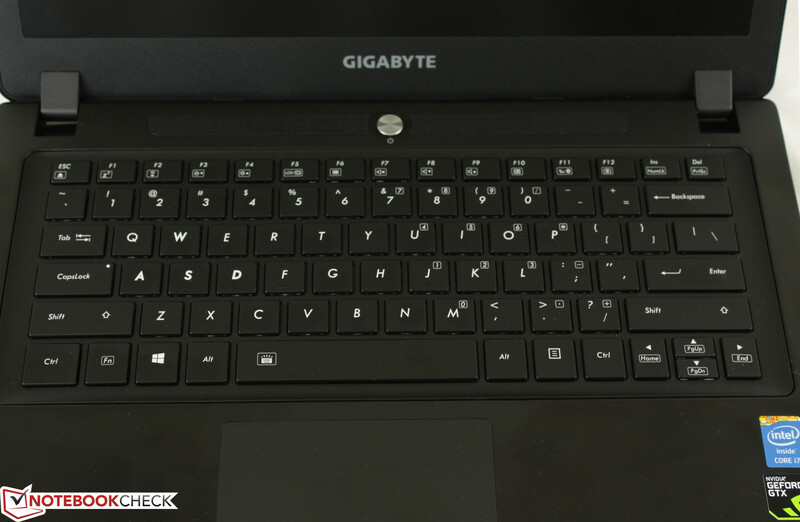 The two dedicated click keys feel cheap compared to the touchpad and keyboard with shallow travel, but feedback is firm and reliable enough for comfortable use if needed. Compared to touchpads with integrated keys, the dedicated keys make it easier to click and drag or highlight text. The P34W v3 utilizes a matte 1080p IPS display with no other options available. This means no glossy or glass touchscreen options - the sole display option is focused on gaming with no other distractions to keep both price and weight low. 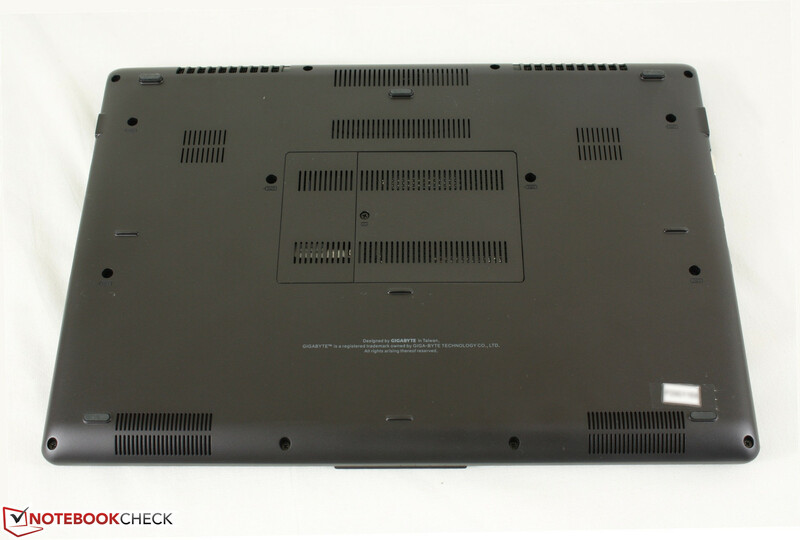 Furthermore, this is a high quality AU Optronics B140HAN01.1 panel that can also be found on a number of Clevo barebone models including the Schenker C404 and is also the same panel on Gigabyte's own P34G. Colors are subjectively deep and images appear sharp with no screen-door effect or other abnormalities. Some "color noise" can be observed if viewing up-close and on a pure white background, though this is common on matte screens. 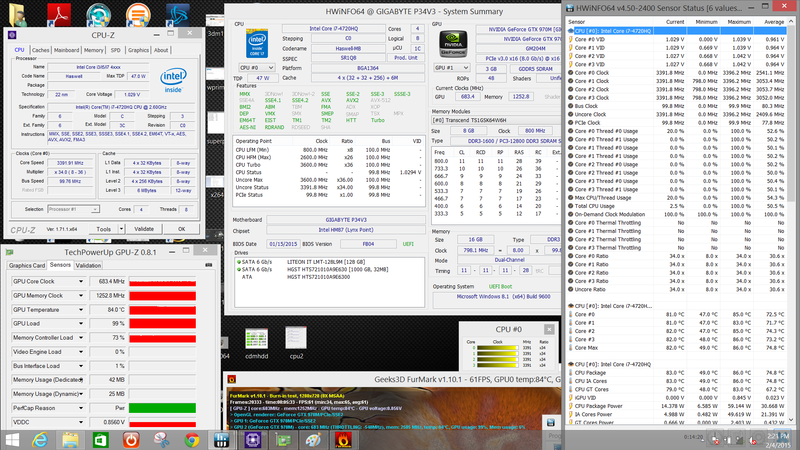 Brightness is more than sufficient for a gaming notebook at about 300 nits. Contrast could be better at just below 500:1, though the accurate grayscale makes up for it. 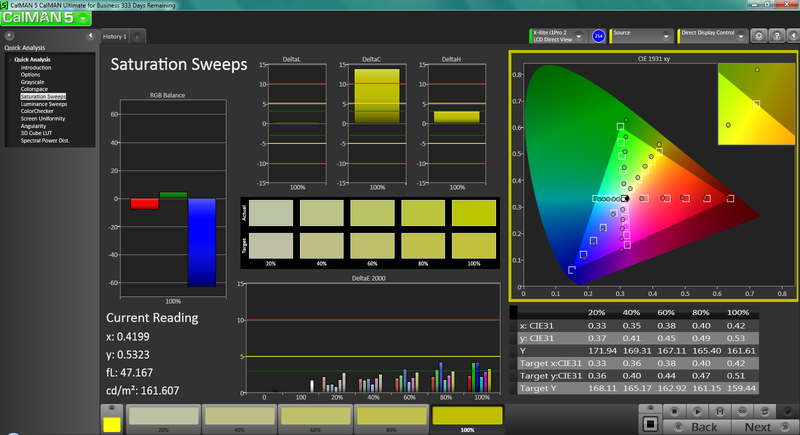 Color space reproduction is very good at 60.4 percent and 81.8 percent of the AdobeRGB and sRGB spectrums, respectively. This is wider than most mainstream TN panels and many gaming notebooks where 60 to 70 percent of the sRGB spectrum is the norm. For an even better display, very high-end gaming models (such as those from Eurocom) can be equipped with TN panels designed to cover 95 percent of the AdobeRGB spectrum for serious graphics work in addition to gaming. 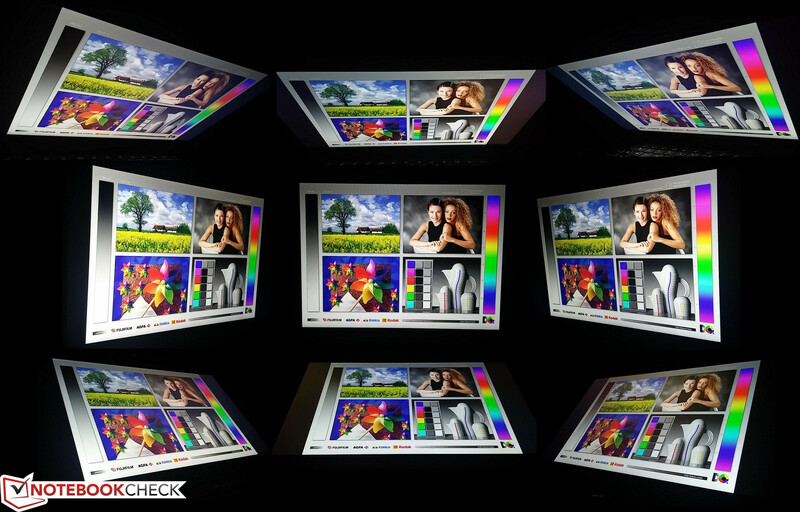 Further display analyses with an X-Rite spectrophotometer reveal very accurate colors across the board, good RGB balance, and consistent grayscale out-of-the-box. 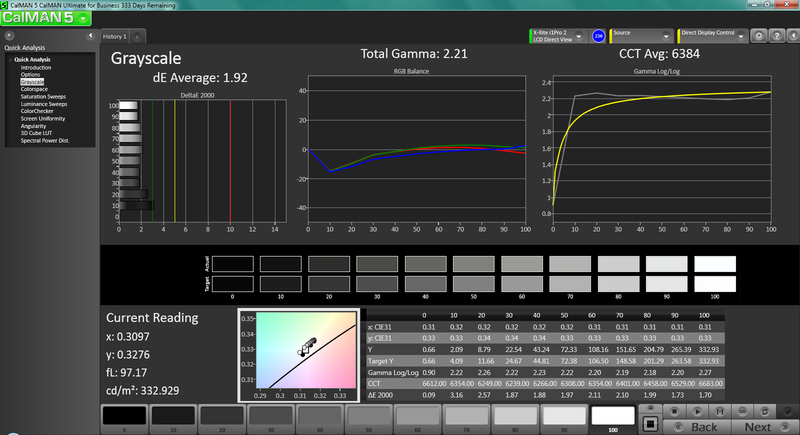 Colors on the P34W generally become less accurate the higher the saturation level, though only by slight amounts. 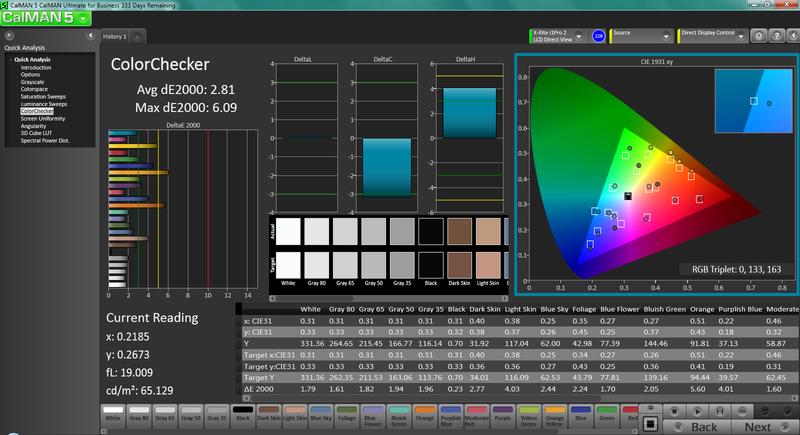 Perhaps more notably, the color temperature is not overly cool and avoids the bluish screen tint that is so common on notebook displays. Unsurprisingly, these results are close to our measurements on the P34G where a similar AU Optronics display panel is used. Outdoor visibility is average if at maximum screen brightness and on a cloudy day. 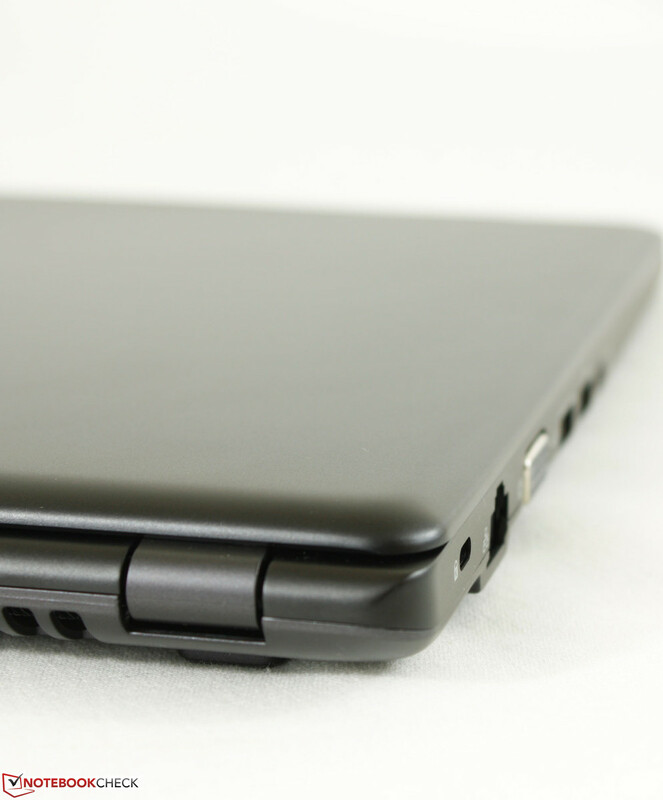 Combined with the light weight, small size, and matte display, the P34W will work well outdoors should the occasion call for a quick email or document check, which is already a lot more than what we can say for other high-end gaming notebooks. 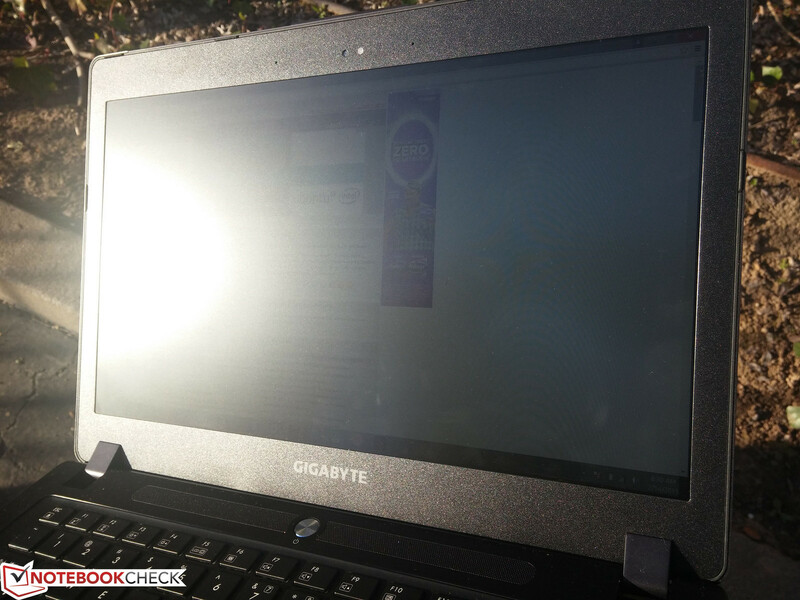 Regardless, working under direct sunlight is still very difficult as the screen will become washed out. Viewing angles are excellent as expected from an IPS panel as colors do not shift or degrade if viewing from extreme angles above or below the normal. This makes it much easier to share the display with others nearby for games or movies. 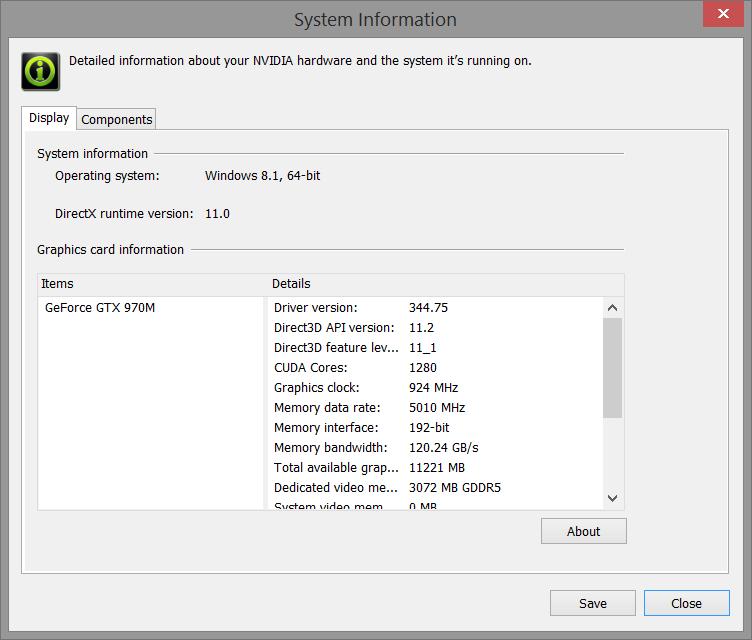 Configurable options are limited to a Core i7-4720HQ CPU and GTX 970M GPU. 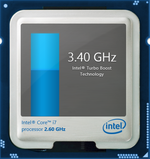 Power Saver will limit the Haswell CPU to just 800 MHz, but it is otherwise capable of running at its base 2.6 GHz speed with Turbo Boost up to 3.4 GHz. Similarly, the Maxwell GPU can run up to 1038 MHz via Turbo down to just 135/162 MHz core/memory or power down almost completely to save power. 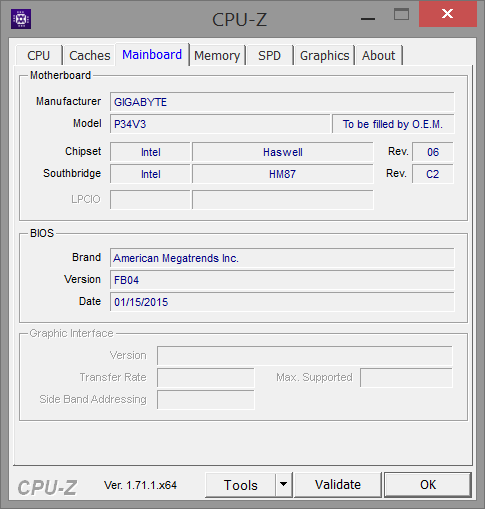 The integrated HD 4600 GPU can be activated via Optimus for additional power savings. 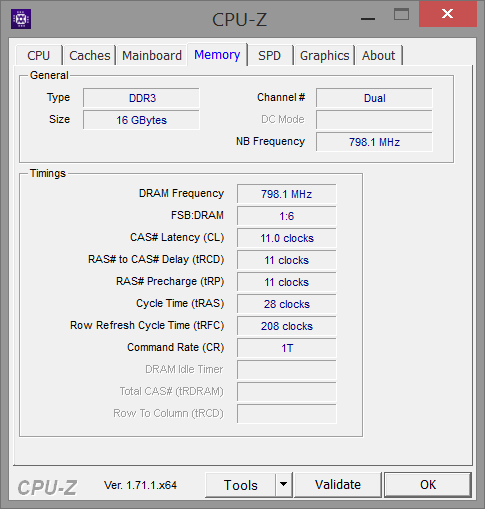 System RAM is provided by two Transcend 800 MHz DDR3L modules for a total of 16 GB. 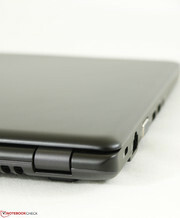 The two RAM slots are quickly accessible via a small hatch on the bottom of the notebook. 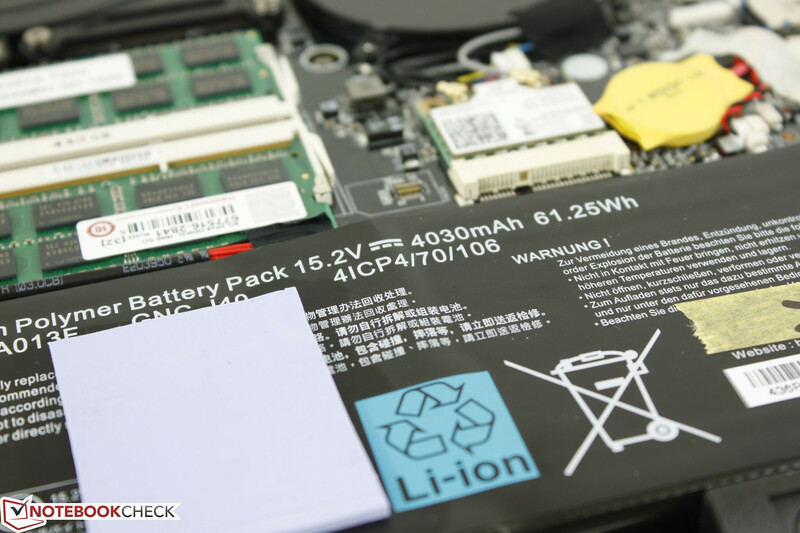 The entire panel can also be removed quite easily via a Philips screwdriver to reveal the cooling system, HDD, mSATA SSD, battery, and other major components. 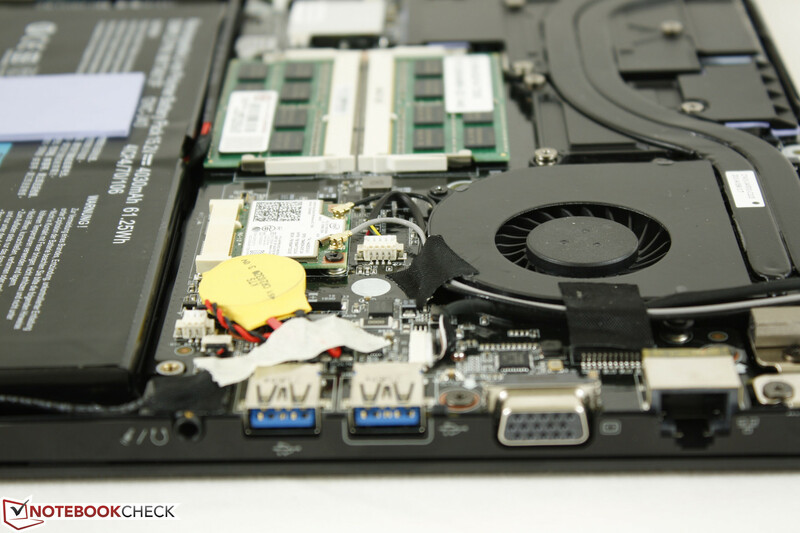 The GPU is soldered onto the board instead of connecting via an MXM 3.0 port as is common on larger notebooks and barebone models. 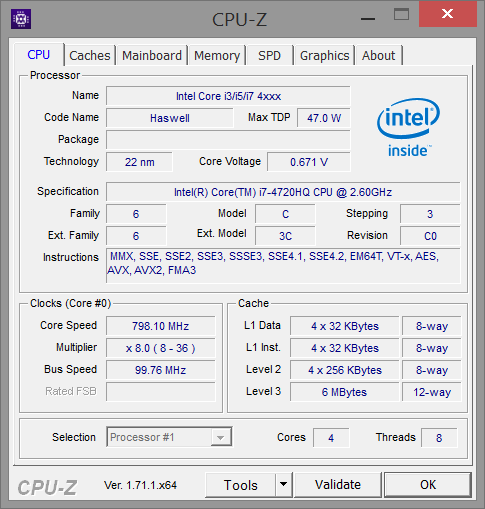 The high-end i7-4720HQ CPU in the P34W returns very high scores in synthetic benchmarks that are in the same ballpark as other similarly equipped systems such as the MSI GS60 Ghost and GS70. 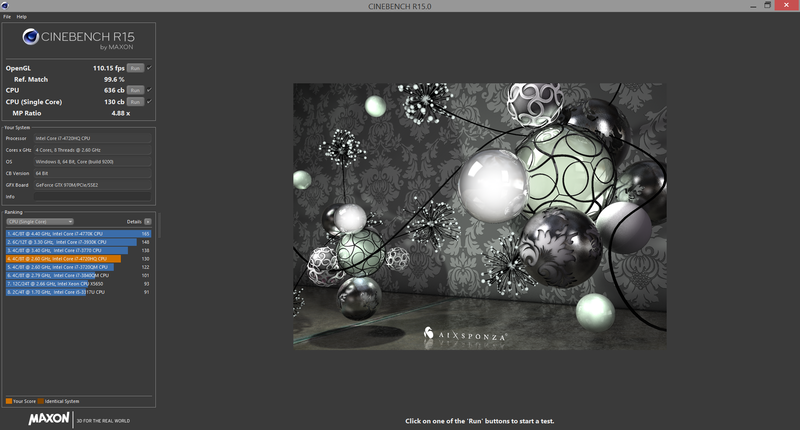 The CineBench R15 multi-core score of 635 points is slightly above that of the desktop Core i7-2600K while consuming just a fraction of the TDP. Similarly, single-core performance according to Super Pi is just slightly higher than the i7-2820QM, which is one of the fastest consumer-based mobile Sandy Bridge cores available. Simply put, this Haswell core is more than enough for current gaming needs. 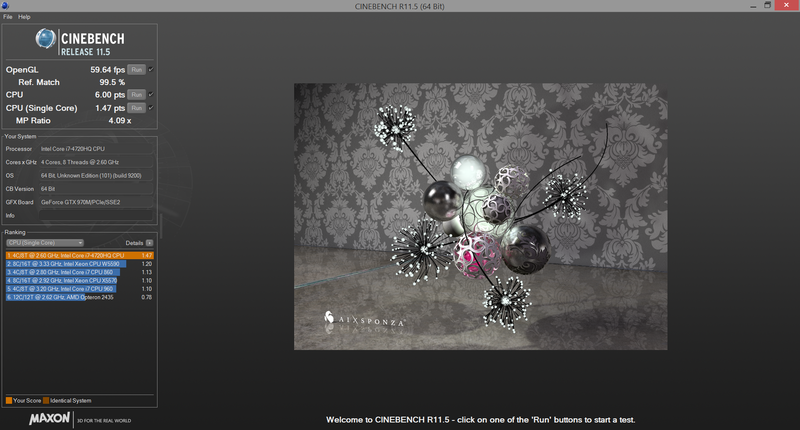 More technical information and benchmarks on the Core i7-4720HQ can be found on our dedicated CPU page here. 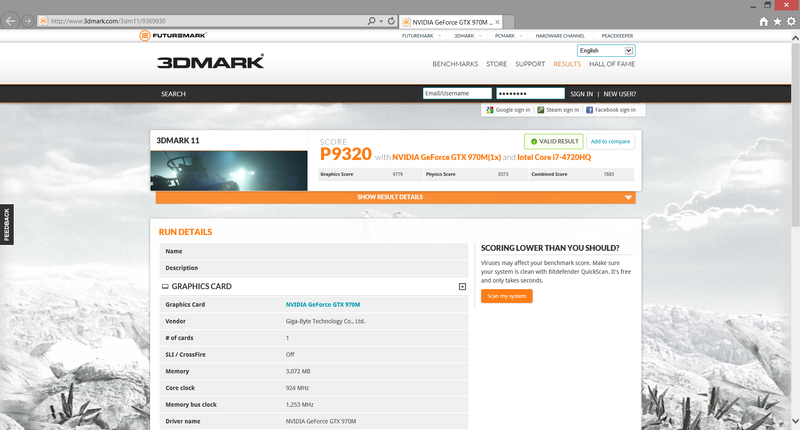 The final PCMark 7 score of 6182 points is very similar to other high-end and much larger gaming models like the MSI GS60 and Schenker XMG P704, both of which also carry dedicated SSDs and GTX class GPUs. 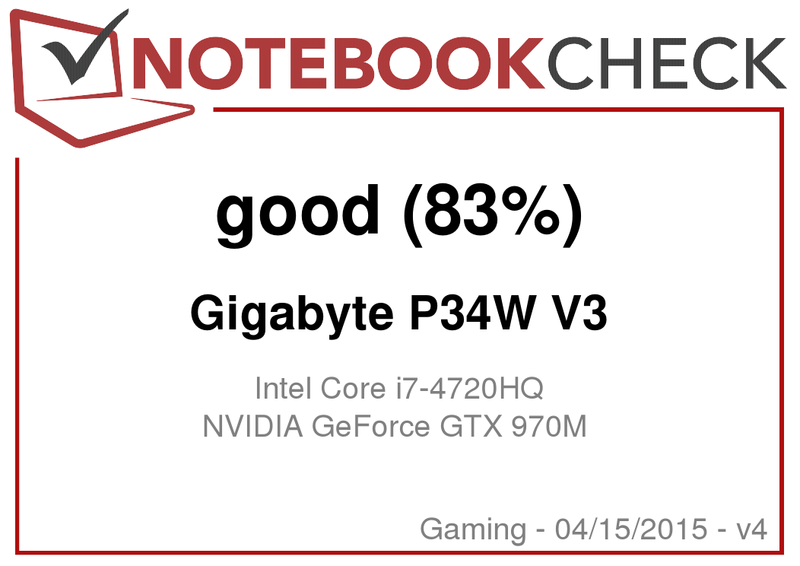 Considering that the highest score in our database is 6931 points, the 14-inch P34W already ranks as one of the fastest lightweight gaming notebooks available. 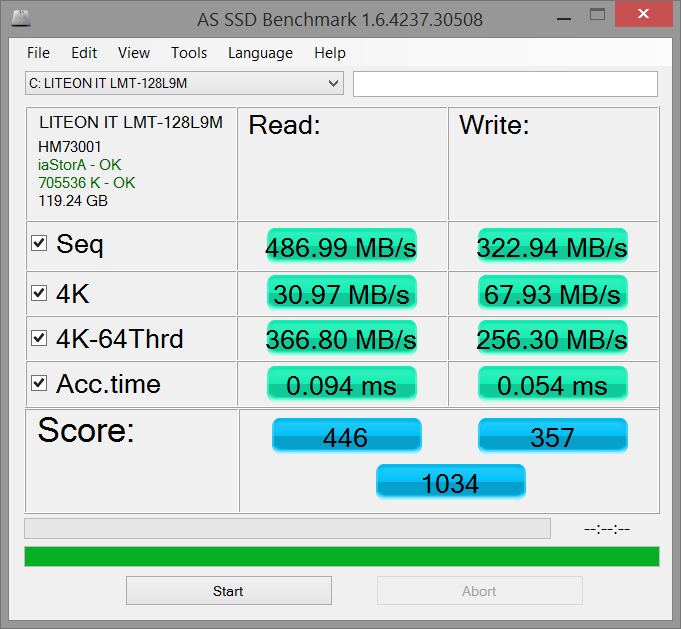 Subjectively, OS navigation and multi-tasking feel snappy similar to an SSD-based Ultrabook. We did experience one odd system crash simply by right-clicking on the desktop, but programs and applications launch quickly and effortlessly nonetheless. 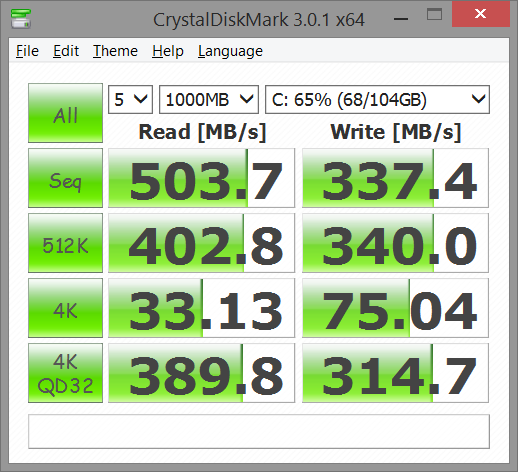 Running a high-end gaming system on a sole 5400 RPM HDD is like driving an automatic sports car - it's still fun, but you get the feeling that it could have been much more exciting. 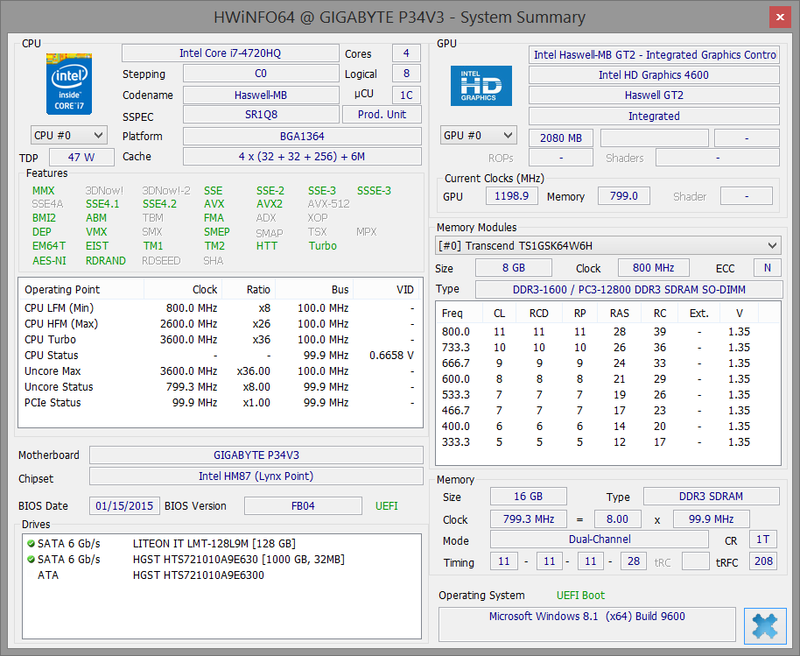 Luckily, the P34W includes both a 2.5-inch SATA III slot and an mSATA slot for both extensive storage and speedy performance. 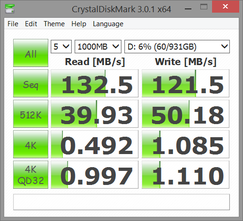 Our test model is equipped with a primary Lite-On 128 GB mSATA SSD and a secondary Western Digital 7200 RPM 1 TB HDD. 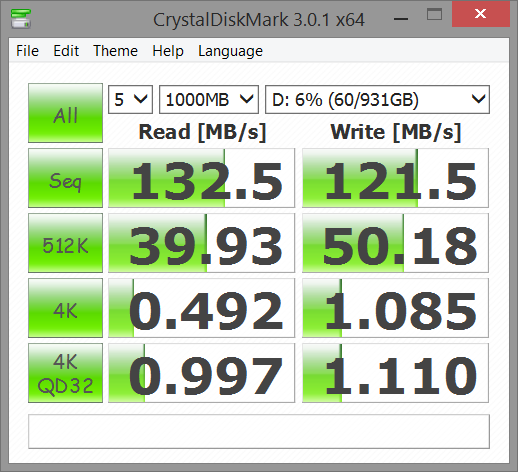 SSD performance according to Crystal Disk Mark is standard for a SATA III class SSD with sequential read and write rates above 500 MB/s and 300 MB/s, respectively. 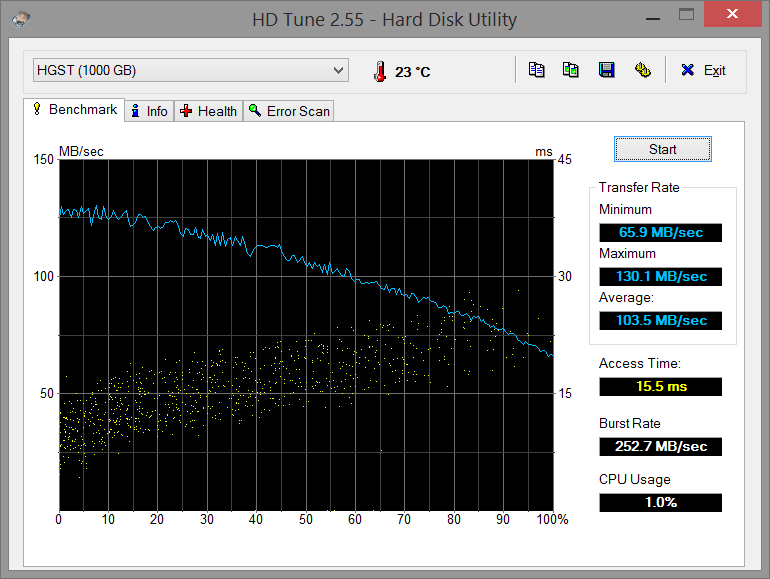 The secondary HDD returns a high average transfer rate of just above 100 MB/s according to HD Tune where most 7200 RPM drives are closer to the 90 MB/s range. Note that the P34W does not support RAID - a feature that many larger gaming notebooks have as standard in this price range. The GTX 970M is one of the fastest single GPU solutions on the mobile market. 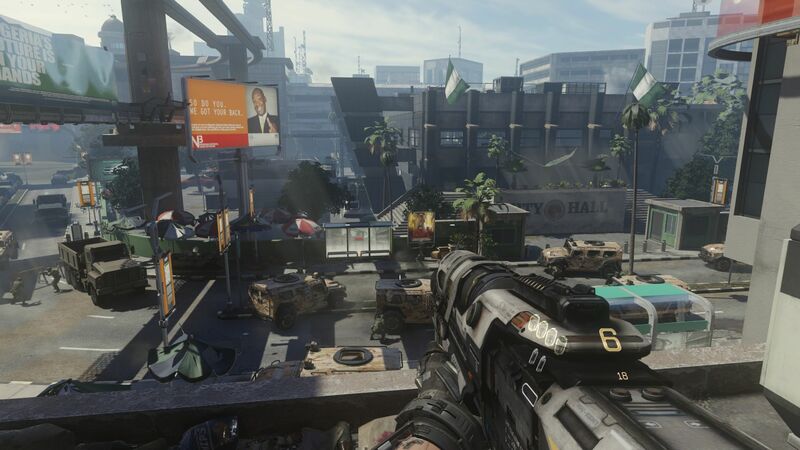 Synthetic graphics benchmarks place the system right in between the GTX 980M and GTX 880M as expected and is well over 50 percent faster than both the GTX 870M and Radeon R9 M290X in 3DMark benchmarks. 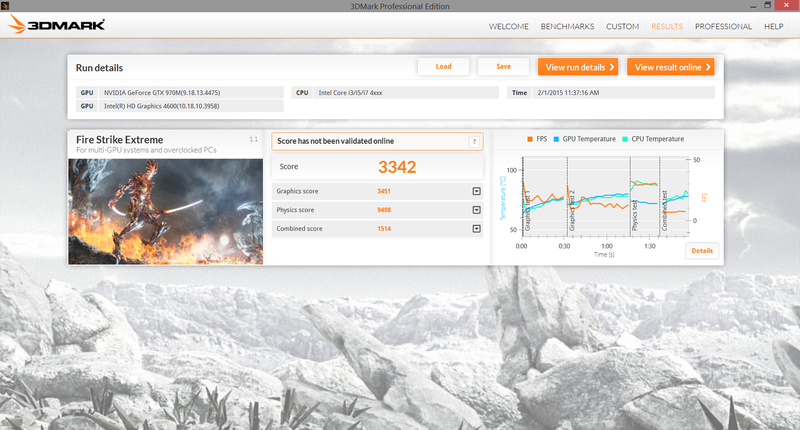 Compared to other systems with the same GTX 970M GPU, the P34W shows similar results. Note that the GTX 970M comes in two flavors: 3 GB GDDR5 RAM and 6 GB GDDR5 RAM. 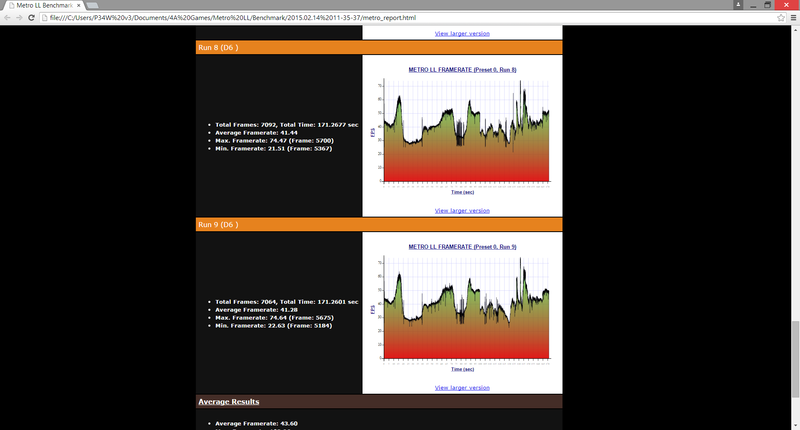 When compared to the Schenker XMG U505 and its 6 GB 970M, the final 3DMark numbers are still essentially identical. 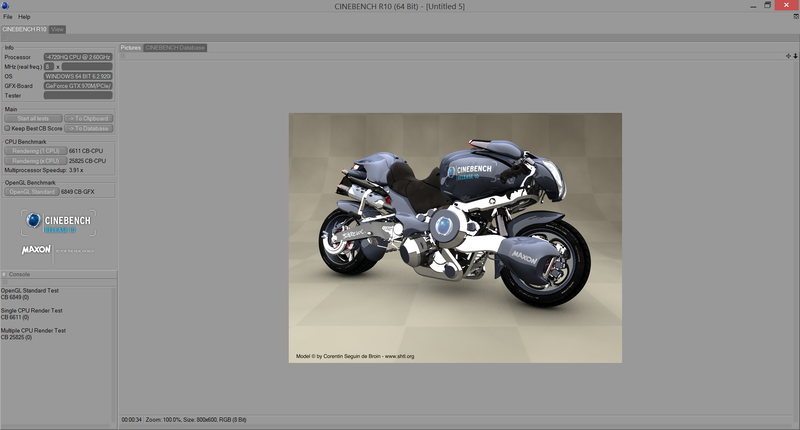 The 6 GB model will likely show an advantage at higher resolutions with more extreme textures. Games play phenomenally on the P34W up to the highest graphical settings. Certain titles stay well over 60 FPS with maxed out settings and are potentially prime candidates for 3K gaming should Gigabyte choose to upgrade the display on this model in the future. More intensive titles like Sleeping Dogs and Ryse average about 50 FPS or a little less at the native 1080p resolution, so the more powerful GTX 980M users still have something to brag about. 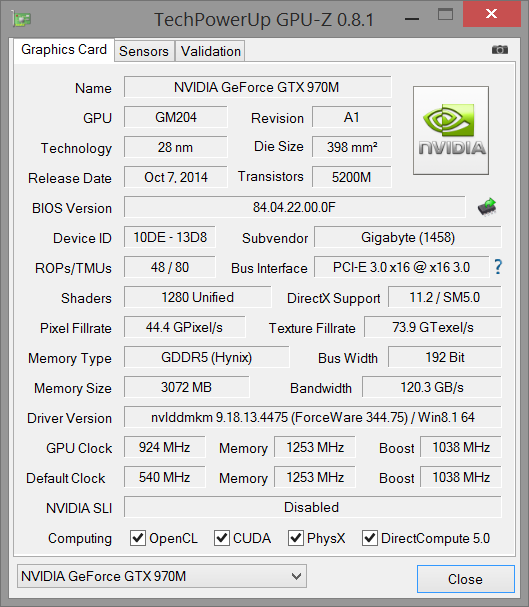 For more comparisons and benchmarks on the GTX 970M, see our dedicated GPU page here. We stress the P34W with synthetic benchmarks to observe for any throttling or stability issues. With Prime95 active, the i7-4720HQ tops out at 3 GHz or 400 MHz less than its rated maximum Turbo Boost while core temperatures reach 80 degrees C. With FurMark active, the GTX 970M fluctuates between 683 MHz and 721 MHz according to GPU-Z while temperature peaks at about 85 degrees C. Memory remains steady at its rated 1252 MHz clock rate. With both Prime95 and FurMark active simultaneously, the CPU can be observed running 100 to 200 MHz below its base 2.6 GHz clock rate with fluctuations up to 2.9 GHz. 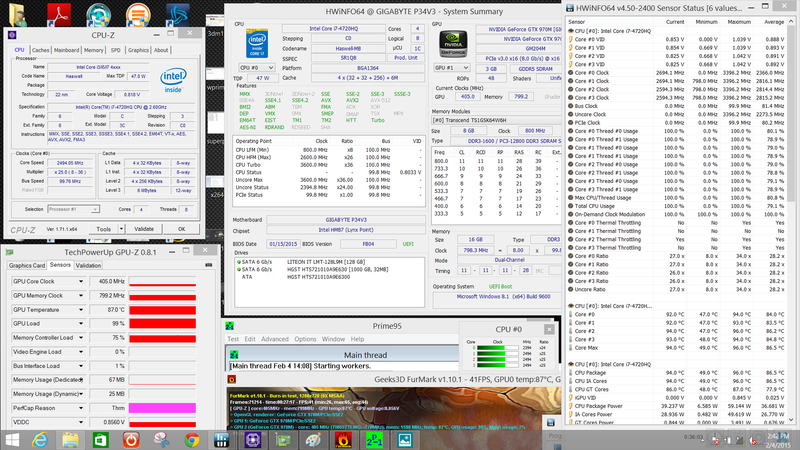 Meanwhile, the GPU experiences a harder hit with core and memory speeds down to 405 MHz and 799 MHz, respectively. CPU temperature peaks at 95 degrees C, which is just 5 degrees shy of of its rated safety limit, while GPU temperatures reach a 90 degrees C ceiling. 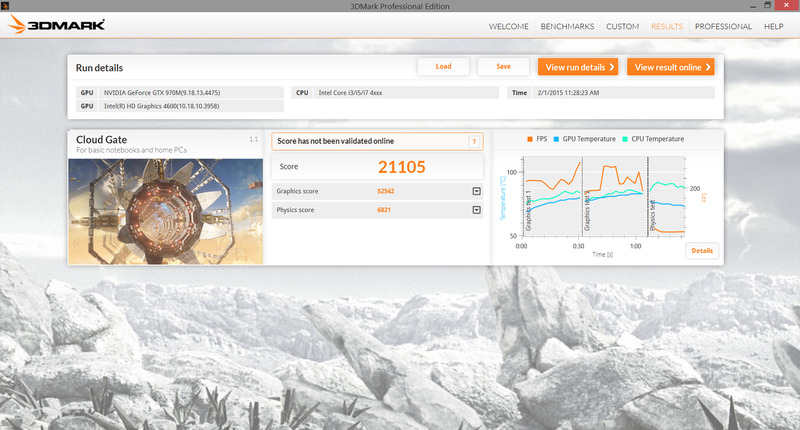 A 3DMark 11 run immediately following the hour long stress test resulted in no significant differences in GPU scores, though the CPU score takes a small hit from 8373 points before stress and 8078 points post stress. 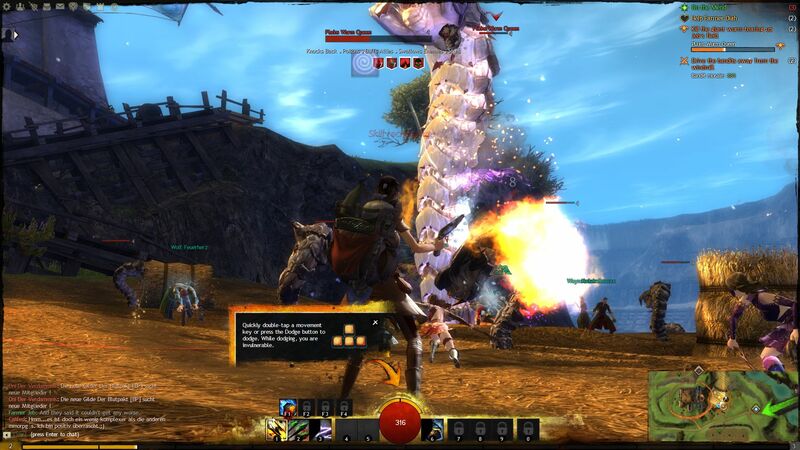 In the next section, we test to see how this will affect performance in games. 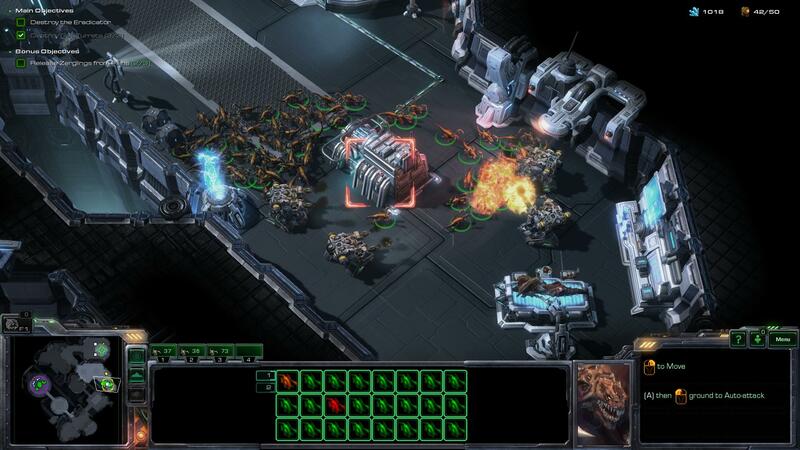 Gaming on battery power will have a much more notable impact on performance. 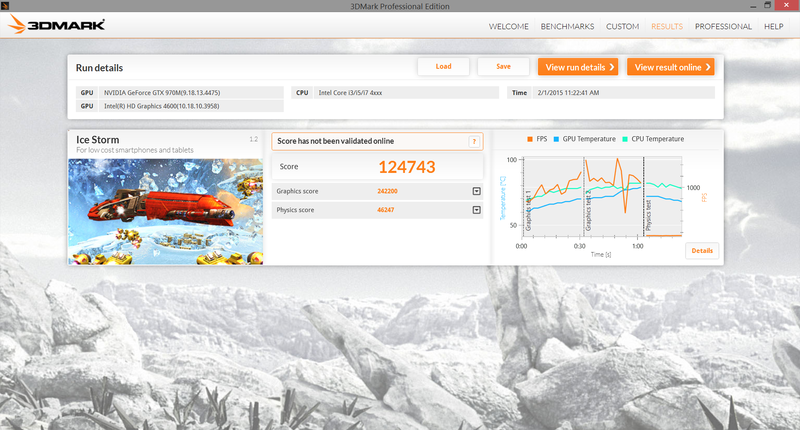 3DMark 11 GPU and CPU scores drop to 6231 points and 6811 points, respectively, compared to 9779 points and 8373 points on AC power. 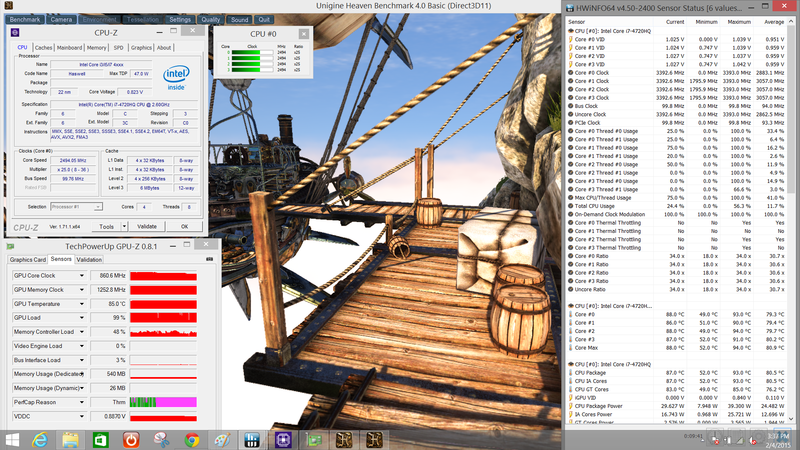 The CPU can be observed operating at just 800 - 1600 MHz while GPU memory remains flat at just 405 MHz. Next, we stress with Unigine Heaven 4.0 for a more accurate portrayal of gaming conditions. 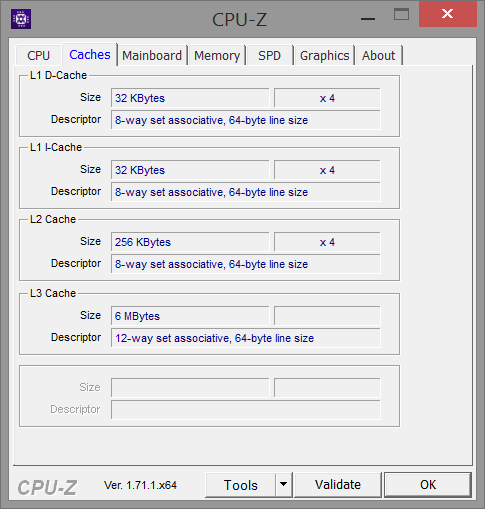 The CPU can be observed running at its full 3.4 GHz speed, but will eventually drop to 2.5 - 2.6 GHz with only occasion jumps to 3.4 GHz thereafter. 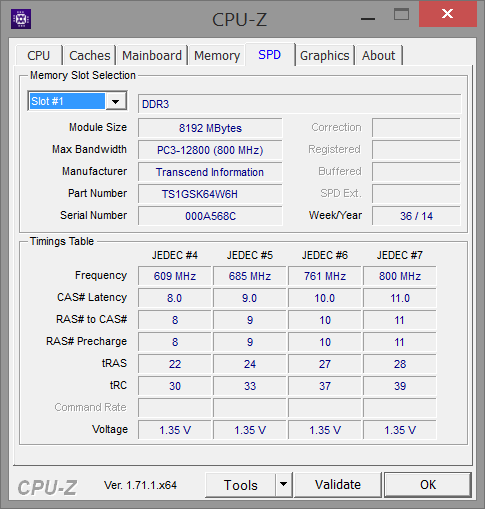 Likewise, the GPU will start at its maximum 1037.8 MHz clock before steadily dropping towards the 700 MHz range over time. As a result, both the CPU and GPU are unable to maintain Turbo Boost for very long and will actually level off below their base speeds. 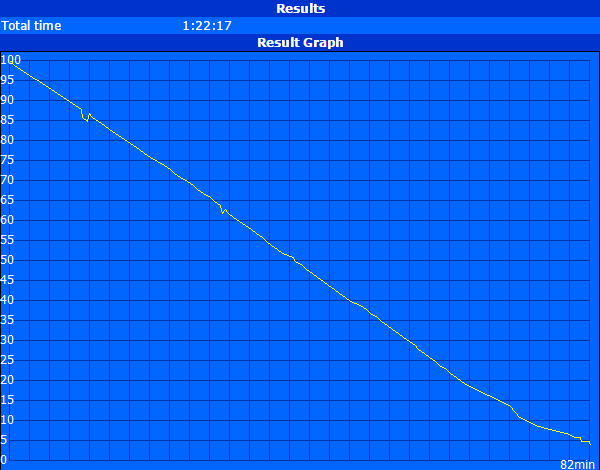 This unfortunately has a notable effect on frame rates when gaming. 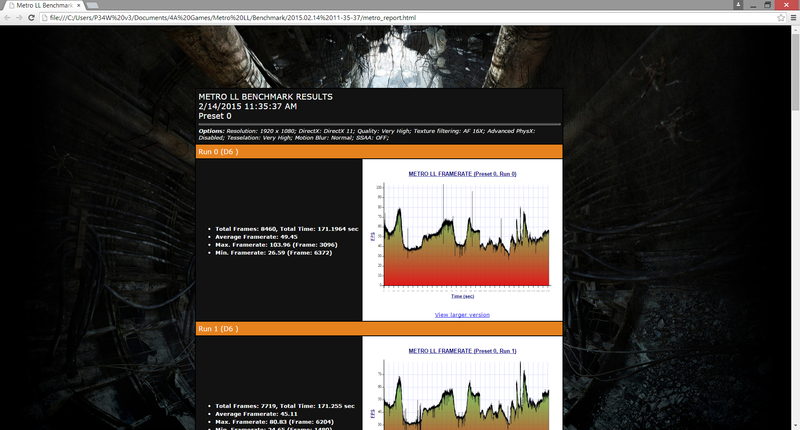 With the Metro 2033: Last Light benchmark set to 10 consecutive runs, the first run averages about 50 FPS on very high 1080p settings - standard for a GTX 970M - but this average steadily drops to 45 FPS, 44 FPS, and eventually levels off at about 41 FPS. Gigabyte's "Supra-cool" technology is at its core two 50 mm fans sharing two heat pipes to efficiently cool the CPU and GPU. The fans are never idle - they can be heard whirring even when the system is idle at the highest possible power-saving settings. If on the High Performance profile with the dGPU activated, the system can be as loud as 38 dB(A) just by idling on the desktop. For comparison, the ThinkPad Yoga 14 reaches 38 dB(A) only when under high loads. 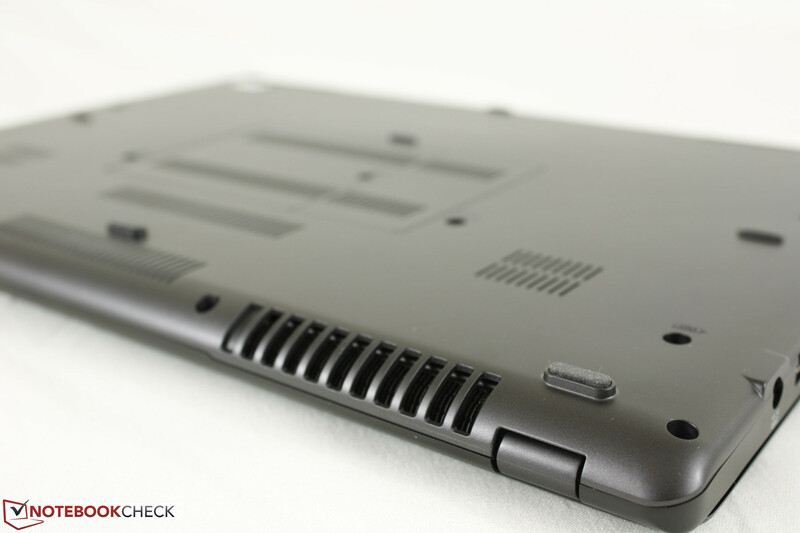 We definitely recommend putting the notebook and fan in Power Saver and Stealth mode, respectively, if using the P34W in classrooms or libraries. This will also prevent the fans from pulsating between high and low RPMs when running applications. When gaming, fan noise will quickly creep up to 43.8 dB(A) and then 48.7 dB(A). Fan noise north of 50 dB(A) is also possible under extreme conditions. Activating "Max Fan" mode via Gigabyte Smart Manager will bump fan noise to a blistering 61.2 dB(A), which is one of the highest we've recorded from a notebook. Larger gaming notebooks tend to stay in the lower 40 dB(A) region when stressed. Surface temperatures when idle are not as flat as we would have liked on both sides of the notebook. The temperature gradient is even more extreme on the bottom of the unit near the rear of the notebook as the dual heat pipes are in direct contact with the cover. Consequently, the hottest spots will always be on the surface directly on top of the heat pipes, especially in the area between the CPU and GPU. We were able to record surface temperatures as high as 43 degrees C on this particular spot while on the Power Saver profile with integrated graphics active. 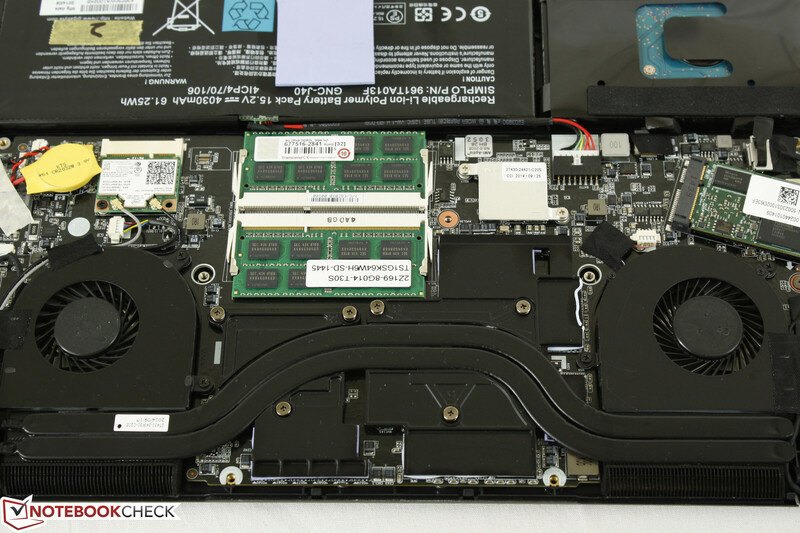 This is similar to what we found on the P34G since they share similar cooling solutions. 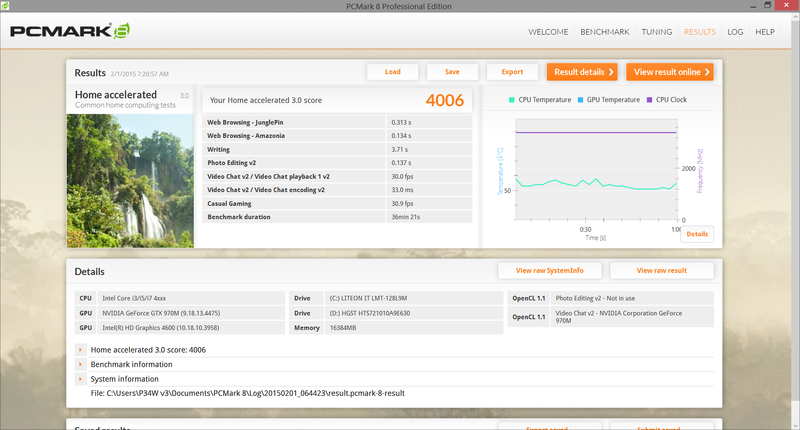 Meanwhile, the Blade 14, Yoga 14, and Lenovo Y40 are much cooler all-around when at an idling state. When under maximum load, the P34W does a fantastic job of concentrating most of the generated heat towards the rear of the unit and away from the user's palms. 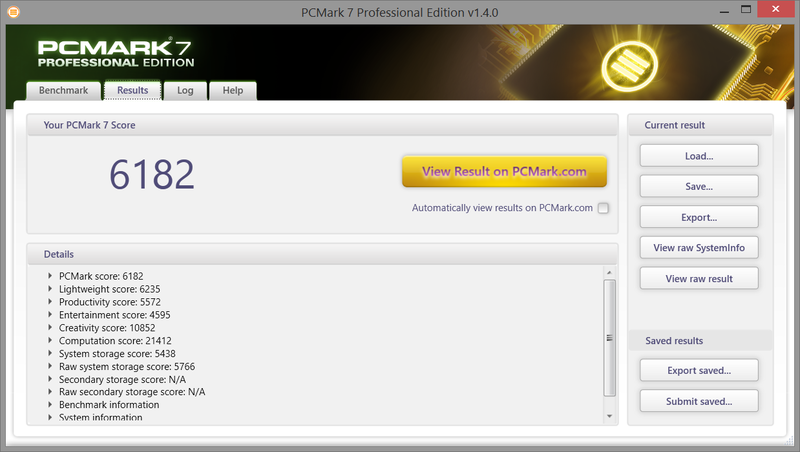 This is compared to the Razer Blade or Alienware 14 which experience more even rise in temperatures across both sides. 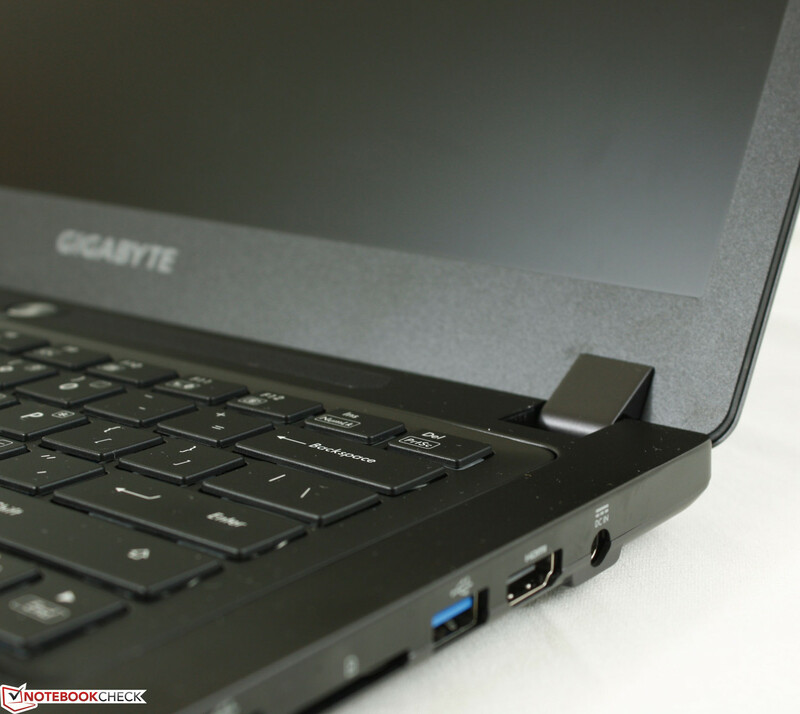 Nonetheless, the right side of the keyboard on the Gigabyte can become much warmer than the left by up to 10 degrees C and the rear can be quite hot at well over 50 degrees C. These high temperatures shouldn't be a huge issue as long as gaming is done on a flat desk with the ventilation grilles unimpeded. WASD-heavy games will also help to avoid the much warmer right side of the keyboard. (±) The average temperature for the upper side under maximal load is 33.8 °C / 93 F, compared to the average of 32.9 °C / 91 F for the devices in the class Gaming. (-) The maximum temperature on the upper side is 45.2 °C / 113 F, compared to the average of 39.3 °C / 103 F, ranging from 21.6 to 68.8 °C for the class Gaming. As amazing as the rest of the specs may be, the 1.5 W stereo speakers here are standard and average at best. 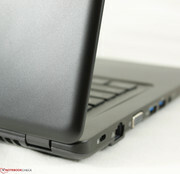 The system lacks bass - more so than expected even from a lightweight notebook. 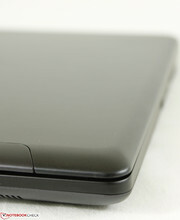 The Samsung Series 9, for example, produces both deeper sounds and a wider range than the P34W. The Dolby Digital Plus software helps a bit, but dedicated 3.5 mm audio solutions are recommended. 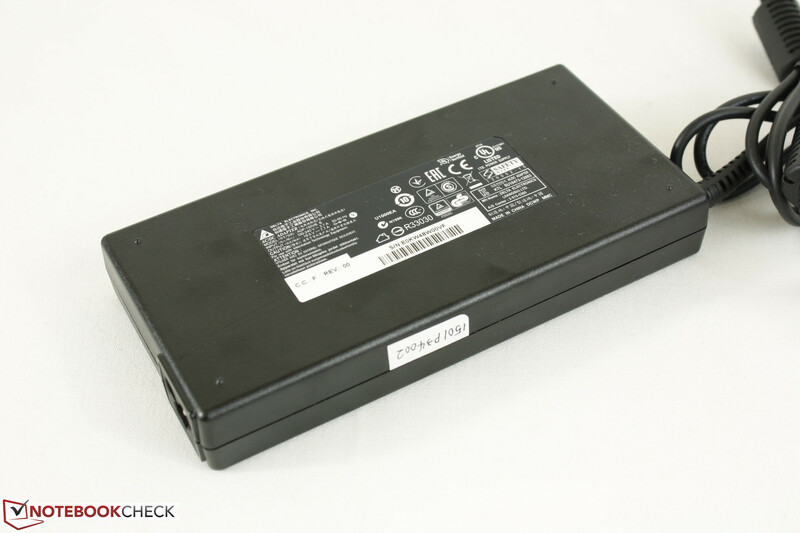 Power is provided by an internal non-removable 4030 mAh Li-Ion polymer module. 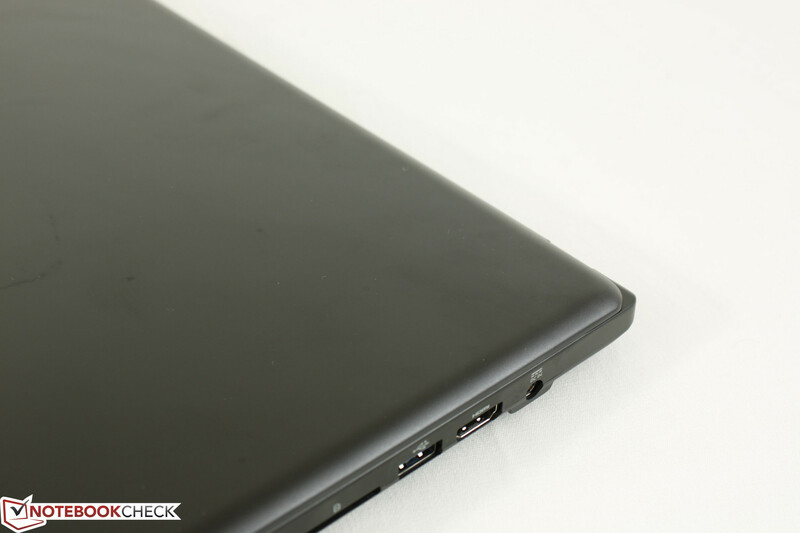 The capacity is slightly larger than the Yoga 14 (3785 mAh), but less than the Razer Blade 14 (6400 mAh) and even Gigabyte's own P34G (4300 mAh). Runtimes are good for a gaming notebook at a little over 4.5 hours of constant WLAN use at a screen brightness of 150 nits (setting 5/10). The more powerful components prevent the P34W from achieving longer runtimes than other 14-inch gaming models as the Yoga 14 and Lenovo Y40 can last longer by at least an hour or more under the same conditions. 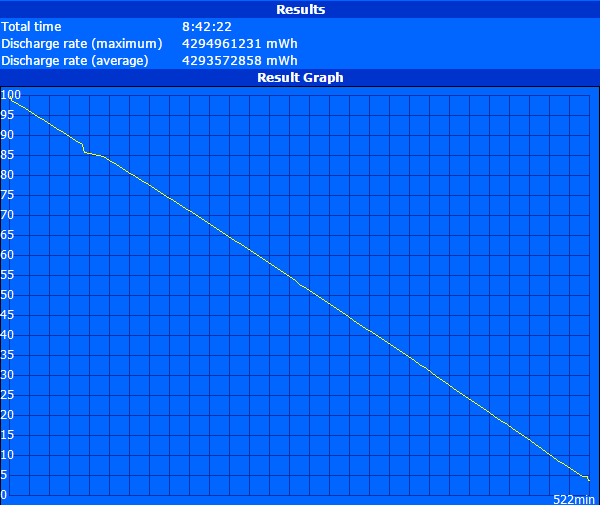 Nonetheless, battery life is still much better than the Razer Blade 14 across the board. The P34W v3 isn't just a fast 14-inch gaming notebook, it's one of the fastest gaming notebooks in any size category. 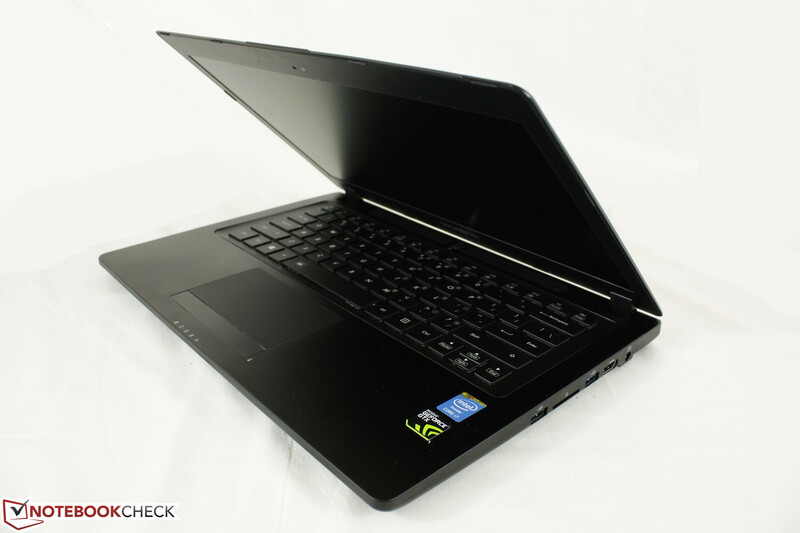 This is a small and lightweight notebook that is on par with hulking 17.3-inch models with GTX 880M GPUs. The hardware is well-made with a high quality matte IPS screen, dual storage options, and easy end-user maintenance. In short, this is a high-end gaming laptop shrunken down to an Ultrabook-like size. Some users may not like the uninspiring chassis, but we imagine that Gigabyte is saving the sharper looks for the Aorus lineup instead. A number of sacrifices have been made as one can only fit so much in a 20.9 mm 14-inch form factor. Firstly, fan noise is very high - enough to consider wearing earphones when gaming to avoid the noise. 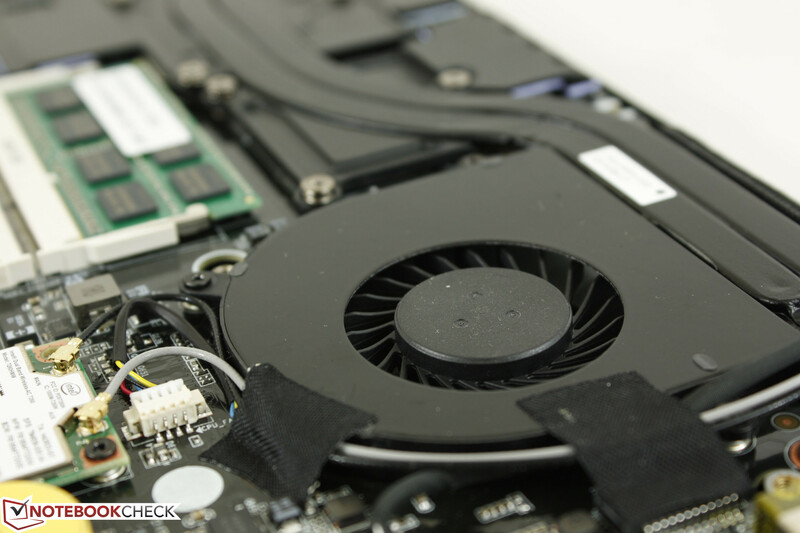 Secondly, the dense internals mean fewer hardware features like subwoofers, RAID support, removable battery, additional ports, and upgradeable CPU or GPU, many of which are common aspects of larger gaming notebooks. Lastly, throttling due to thermal limitations is very real when gaming as the GPU will run below its base clock rate even after a short gaming session. 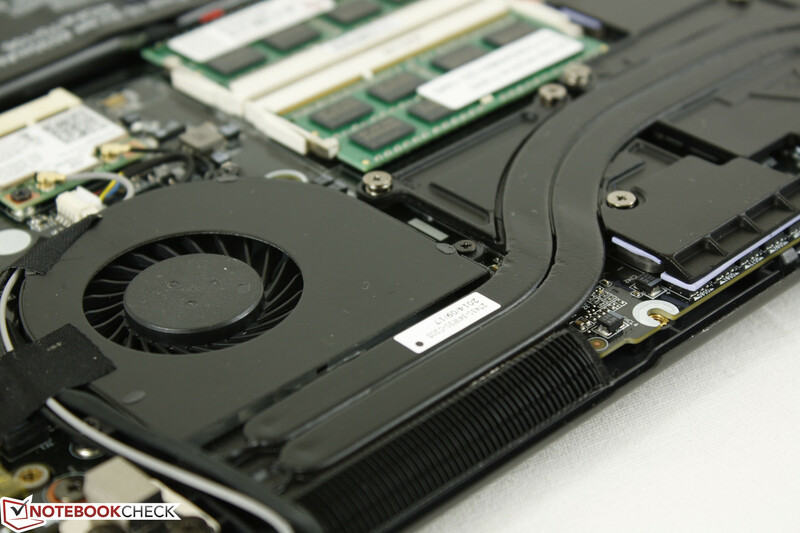 The dual fans, dual heat pipes, and plethora of ventilation grilles can only do so much here versus the cooling systems of larger and heavier gaming notebooks. There are currently no other ultrathin 14-inch notebooks in the market with a GTX 970M except for the recently refreshed Razer Blade 14. It's unfortunate that the Razer will take home most of the headlines and coverage as it features similar hardware and performance for a higher $2000 price point versus $1700 for the P34W v3. For serious gamers constantly on-the-move, the P34W is worth a look. Plenty of ventilation grilles - don't block them! Larger-than-life performance. 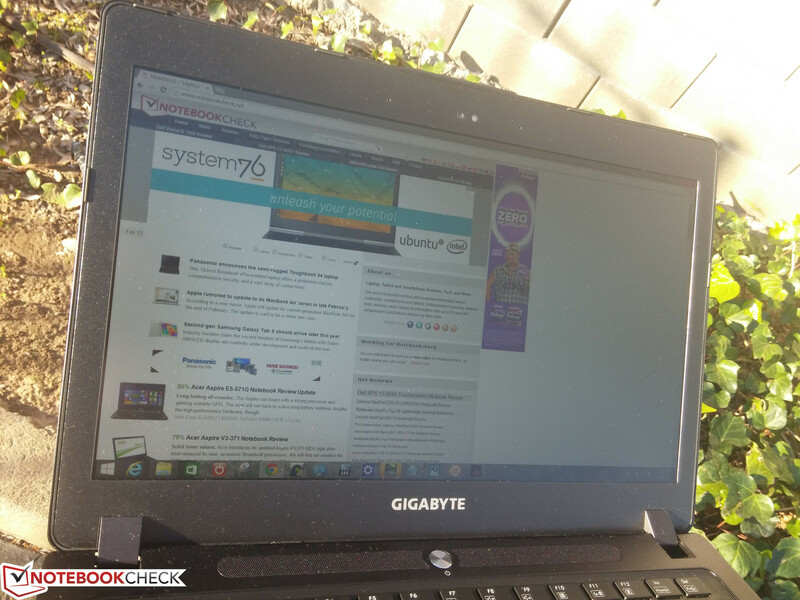 The hardware is fit for a large 17-inch notebook, yet it performs admirably in a thin 14-inch form factor. 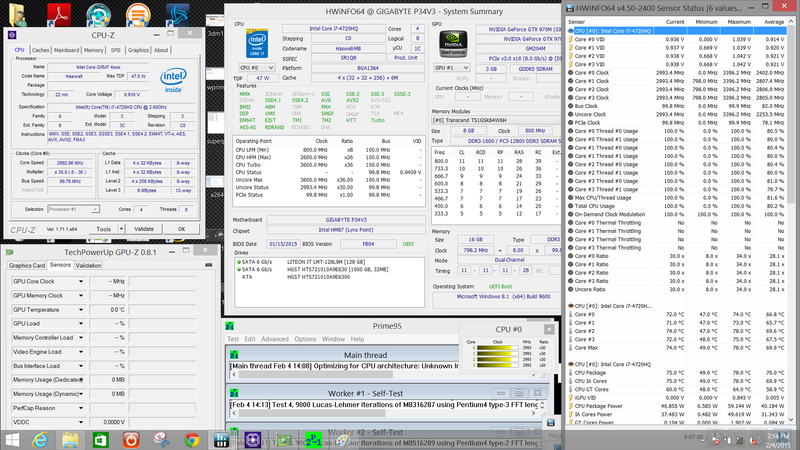 More configuration options, lower fan noise, higher resolution display, 120/144 Hz options, and RAID support. 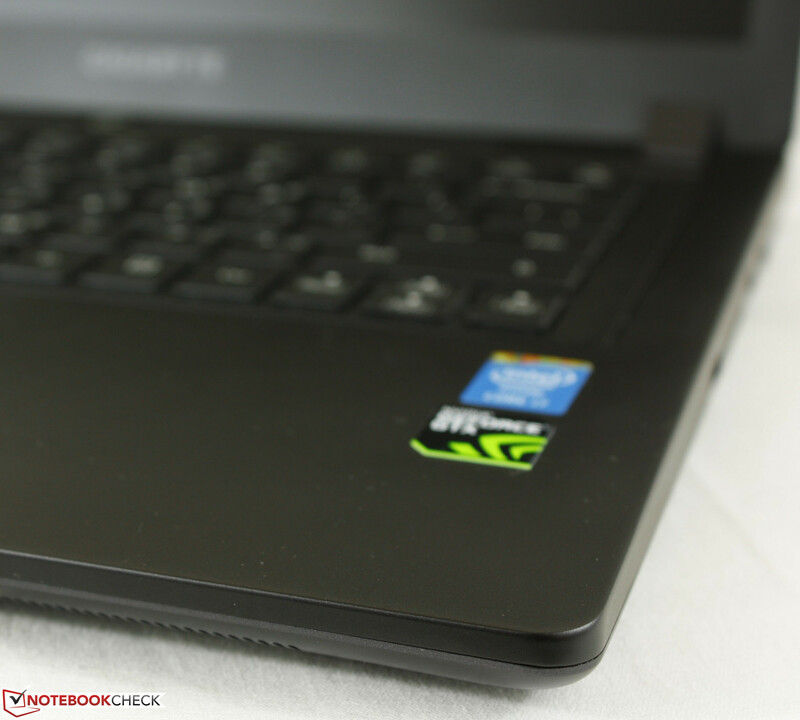 In terms of hardware features, the larger gaming notebooks still have the edge. The slight throttling should also be addressed in future revisions. Extreme performance for the size. 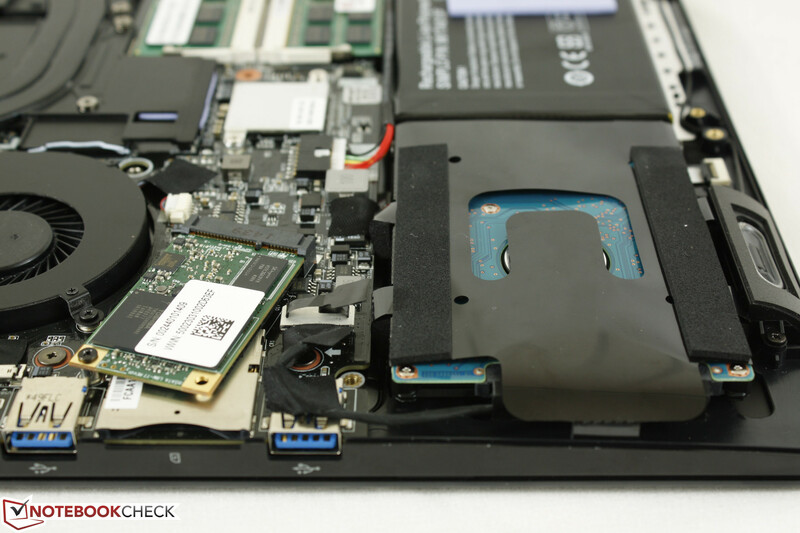 Internals are also easy to access, which is uncommon on ultrathin notebooks let alone ultrathin gaming notebooks.